what makes our starter kits different to other companies? Well we could sell chinese airbrushes at cheap prices but from years of experience we know that the American Paasche airbrushes we sell are far better quality and will last much longer giving better value for money. All of our kits have been put together to be as comprehensive as possible, all you need to add is the air supply (there are options in the listing) , make up brush set , baby (talcum ) powder and surgical spirits. Do we offer any back up? Yes we do . If you have any problems we offer customer service that is second to none. If you call out of hours and leave a contact number we do call you back, if you email we aim to answer within a few hours and of course the old fashioned way (like me) is to telephone , if you call and the office is unmanned there is a message with a mobile phone number you can call. This starter kit is suited to many uses. It is the smallest of our professional kits. 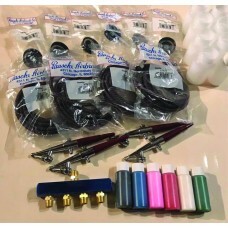 It contains:- 2 x paasche single action airbrushes 2 x 10 foot braided hoses 7 x 3oz ink jars (1 for each colour a.. This starter kit is suited to many uses. It is the middle of our professional kits. 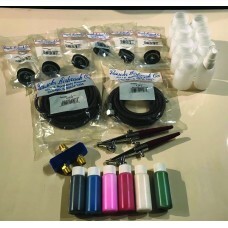 It contains:- 4 x paasche single action airbrushes 4 x 10 foot braided hoses 7 x 3oz ink jars (1 for each colour and.. This starter kit is suited to many uses. It is the biggest of our professional kits. 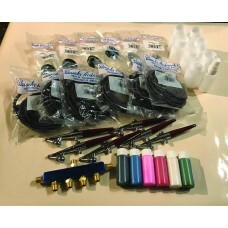 It contains:- 6 x paasche single action airbrushes 6 x 10 foot braided hoses 7 x 3oz ink jars (1 for each colour an..
300ml tin of tensospray medical adhesive. This is widely used to spray onto the back of stencils to help with positioning of them. Please do not order if not in the uk. Not available outside of ..